1. Explain the title of this novel. Why is it called A Lesson Before Dying? Who wants a lesson learned, what two lessons are to be learned, who is to do the teaching, who is to do the learning, who ends up (ironically) learning two lessons, and what two lessons does he learn? I’ve been teaching A Lesson Before Dying in two sections of English099 here at LaGuardia this semester. We are beginning the ACT Exam preparation so I thought that I’d offer some of the “working questions” I’ve been using to sharpen our EXIT Exam skills. I’ve framed these questions so that there are, more or less, two clear answers to the prompts. I would love it if someone would post an entire answer on the comments page! 1. A Lesson Before Dying centers on Grant Wiggins’s relationship with the community he lives in, both Black and white. If Grant is in the courtroom it suggests that he is “there” for his aunt, Jefferson’s Godmother and the Community at large. If he is “not there” he might be creating distance between himself and the community. Please argue in an essay of 300 words or more whether he is there to support his community or not there as a way to distance himself from the proceedings. Please use quotes from the novel to defend your answer. 2. The title A Lesson Before Dying suggests the execution of Jefferson, but might mean much more. Please write an essay of 300 words that describes why the title is either focused on the single lesson to be taught to Jefferson before his execution, or the larger meaning of “lessons” that we must all learn before our time on earth is done. Make sure you have a clear thesis that is supported with specific examples. I get tired of updating this case, but this is better than Monday’s update would have been without this ruling. I was struck by how much vengeance (“Vengeance is mine, I will repay, says the Lord.”) the poor McPhail family means to them. I pray I am never so struck with pain that I seek the death of another to relieve my loss. ATLANTA (AP) — A federal appeals court gave a late reprieve Friday to a Georgia man set to be executed for the 1989 killing of an off-duty police officer in a case in which several witnesses have changed their accounts of the crime. 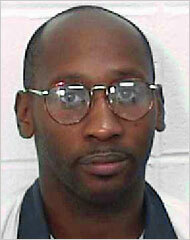 Troy Davis, 40, was scheduled to be executed Monday for the murder of Savannah Police Officer Mark MacPhail. 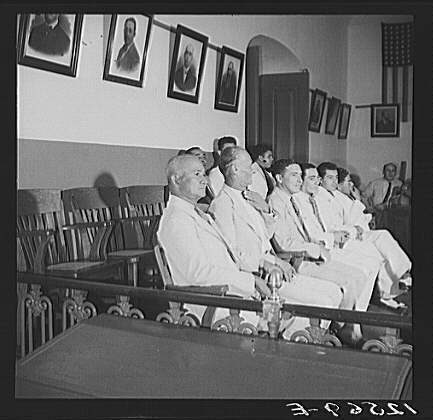 But the three-judge panel of the 11th U.S. Circuit Court of Appeals stayed the execution and ordered his attorneys to prove whether he can meet ”stringent requirements” to press his appeal. Davis’ supporters have called for a new trial because seven of the nine key witnesses against him have recanted their testimony, and the doubts about his guilt have won him the support of former President Jimmy Carter and other prominent advocates. It was the third time since July 2007 that Davis has been spared the death penalty by a late court decision. ATLANTA (AP) — The Supreme Court has cleared the way for a Georgia man to be put to death for killing a police officer two weeks after it halted his execution to consider his appeal. Troy Davis asked the high court to intervene in his case and order a new trial because seven of the nine witnesses against him have recanted their testimony. Former President Jimmy Carter and South Africa Archbishop Desmond Tutu are among prominent supporters who have called for a new trial. The justices granted Davis a reprieve on Sept. 23, less than two hours before his scheduled execution. But they declined Tuesday to give his appeal a full-blown hearing. 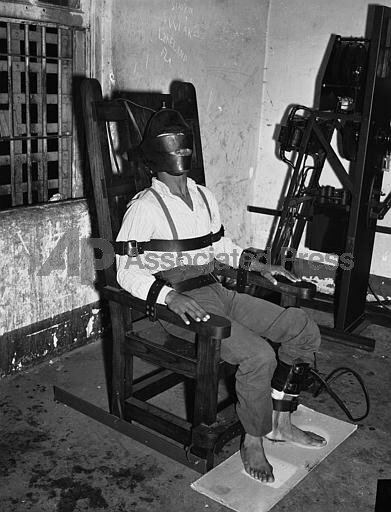 It was not immediately clear when his execution will be scheduled. Davis’ supporters, who erupted in joy when his execution was halted last month, said they were heartbroken when they received word of the decision. The horror and the shame of capital punishment breaks my lapsed Quaker heart. 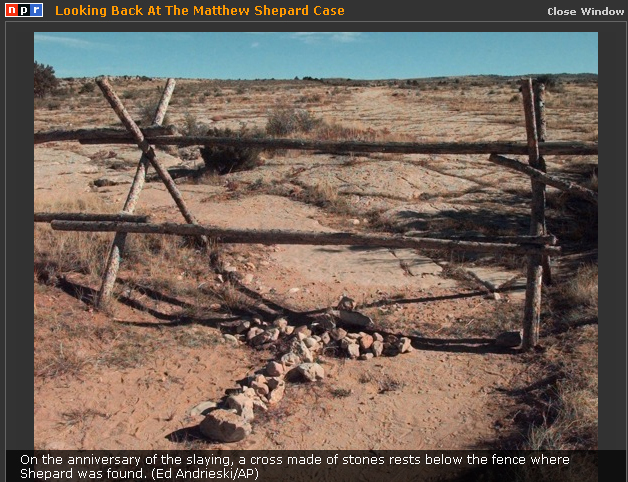 Ten Years ago Matthew Shepard was murdered in Laramie, Wyoming. Four years ago LaGuardia Community College chose Moises Kaufman’s The Laramie Project as its common reading. I raise this here because the 2004-5 common reading and A Lesson Before Dying are not unrelated. 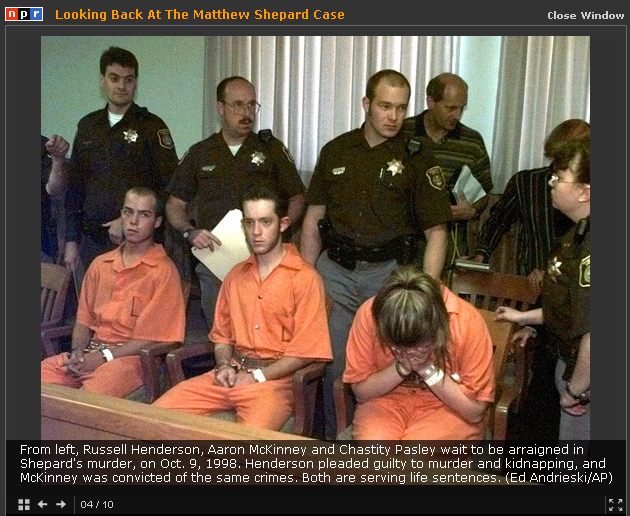 The intolerance that killed Mr. Shepard is at the root of the unjust trial that convicted Jefferson in Gaines’s novel. I really wish that 10/4 could mean “over and out” as it does in radio slang. Lynching is Terrorism; imagination is just as powerful as truth. While this year’s pick, A Lesson Before Dying, is fictional, it is all too true in terms of the underlying prejudice it covers/exposes. As I was reading A Lesson Before Dying this morning in preparation for class tomorrow I was struck with the idea that the underlying tragedy of the kangaroo court that convicted Jefferson was that it, the trial, civil justice, was actually an improvement over the lynch law it replaced. The intolerant and (over-)empowered majority has little faith in its institutions. This might be because they are based on the Constitution and enforced by (often) impartial professionals. 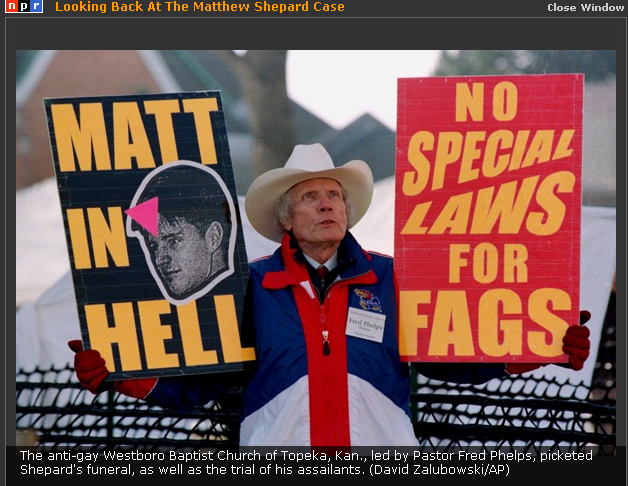 Matthew Shepard was Lynched. Make no mistake about it. This was brought home to me as I listened to this timely and intelligent report on NPR. The more I thought about it, the more I saw a theme of A Lesson Before Dying that I had overlooked. 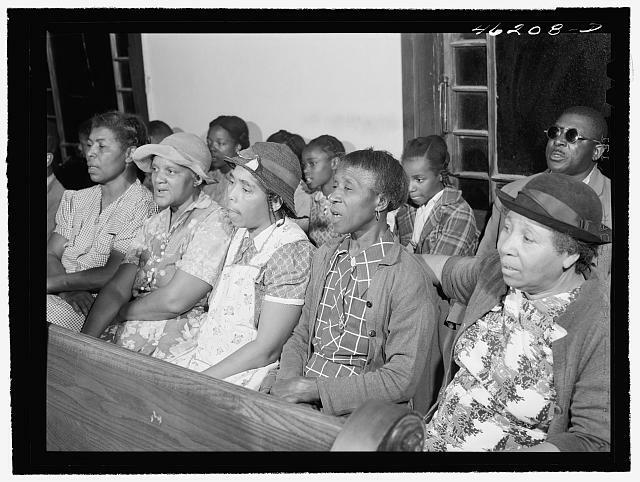 The reason that there is a trial is because there is enough confidence in the white supremacist system in the 1940s Louisiana Cajun community that they didn’t need to take him out and string him up immediately. As I looked over the LaGuardia site compiled by the library and Will Koolsbergen I was struck by how far we have come: the status of hetero supremacy has been chased far enough into the corner that the bigots were eventually brought to justice. On a tangentially related note I heard this story on On The Media about how there is a whispering campaign that undermines one of the presidential candidates “American-ness.” This innuendo is like the undermining of Matthew Shepard’s humanity by challenging his masculinity. Now I am not saying that one political camp is calling for the assassination of the standard-bearer of the other, but this type of sub-conscious challenge (in the minds of sociopaths) is what led to the crucifixion of Matthew Shepard. I am interested in how, or why, you think these cases are like or unlike one another. ATLANTA — The United States Supreme Court issued a stay of execution on Tuesday for a Georgia inmate convicted of killing a police officer in 1989, two hours before his scheduled death by lethal injection. 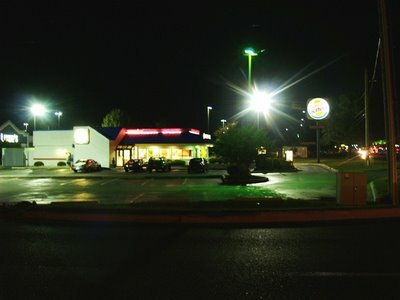 Troy Davis had been scheduled to be executed Tuesday evening in Georgia. The inmate, Troy A. Davis, 39, was convicted of murdering Mark MacPhail, a Savannah police officer. The Supreme Court, which issued the stay without explanation, will decide Monday whether to grant Mr. Davis’s appeal for a new trial. Here is another death-penalty case in the news today. I have two conflicting opinions (and links) of what the case centers on. Is “eyewitness testimony” enough to condemn a man to death? Please read (at least) the excerpts, preferably the entirety of the two cited “articles” (opinion pieces), and write a few sentences about what your opinion is. Nine witnesses testified against Mr. Davis at his trial in 1991, but seven of the nine have since changed their stories. One of the recanting witnesses, Dorothy Ferrell, said she was on parole when she testified and was afraid that she’d be sent back to prison if she didn’t agree to finger Mr. Davis. Officer MacPhail, wearing his police uniform — including badge, shoulder patches, gun belt, .38 revolver and nightstick — ran to the scene of the disturbance. Davis fled. When Officer MacPhail ordered him to halt, Davis turned around and shot him. Officer MacPhail fell to the ground. Davis, smiling, walked up to the stricken officer and shot him several more times. Please decide whether you think that Troy Anthony Davis should be executed this week for the murder of Mark Allen McPhail. Have your say by typing a few sentences in the comments section of this post. “I was not there, yet I was there” (3). But I am reading this voluntarily. This blog is about what you, the LaGuardia students and faculty who have this new book, think about it. Are you reading it in a class, or are you reading it because it was given to you free? Please leave a comment below letting us know how you like (or dislike) this book.